The Etruscan King Lars Porsena at the gates of Rome. “Etruscans” • City Guard, Fiesole, 6th-5th cent. BC • Heavy Axeman, Northern Etruria, 6th cent. BC • Warrior, Northern Etruria, 6th cent. BC • Musicians, Southern Etruria, 6th-4th cent. BC. 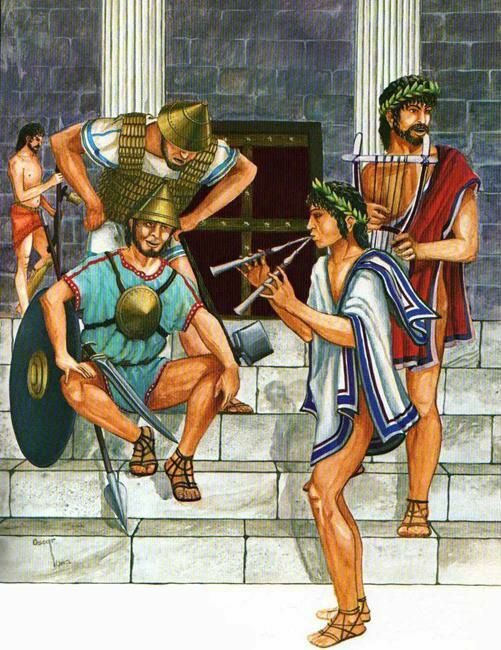 The legendary defeat of the Etruscans at Aricia was described by the first-century- BCE Greek historian Dionysius of Halicarnassus. His account placed the downfall of the Etruscans at roughly the same time that the traditional account of the founding of Rome placed the over- throw of Etruscan king Tarquin the Proud. 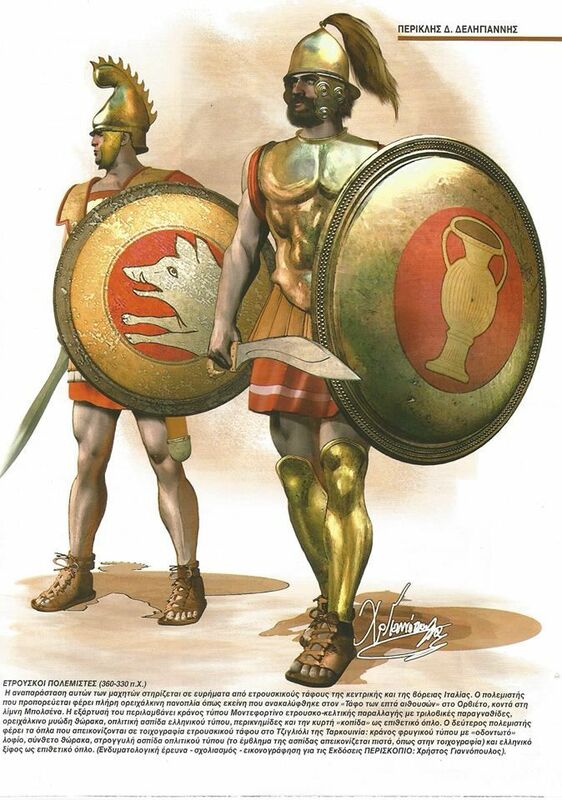 Other legends give further accounts of Roman resistance. One famous myth involved the Etruscan ruler Lars Porsena, who attempted to return the Tarquins to power in Rome. The Romans reputedly demonstrated great courage in the wars that followed. One hero, Horatius, single- handedly held back Porsena’s forces while comrades pulled down a strategic bridge. Another story concerning Porsena is that of Mucius Scaevola, who was captured during an attempt to kill Porsena. When brought before Porsena, Mucius placed his hand on live coals, to show that he was oblivious to pain and that the Romans would continue to resist however long the war endured. Porsena was so impressed that he supposedly ended his siege of the city. Mucius Scaevola was just one of a number of semi-mythical heroes who were later seen as examples of the Roman characteristics of courage, selflessness, and patriotism. The influx into Italy of the Anatolian (Turkish) people we know as the Etruscans brought conflict with the Latin peoples of the region. Etruscan settlers founded Rome by consolidating a number of Latin villages and established in this city-state the Tarquin dynasty. A coup in 509 B. C. E. replaced the last Tarquin king with the Roman republic and initiated warfare between the new forces of Rome and the Etruscans, who held sway over about 40 percent of Italy. The Etruscan military leader Tarquinius Superbus (d. c. 503 B. C. E.) attacked Rome in an effort to retake the city. The forces of an Etruscan ally, Clusium (Chiusi), overran Rome, but then Lars Porsena, the king of Clusium, claimed the prize for himself. To dislodge his erstwhile ally, Tarquinius joined forces with the Sabines, some Latins, and the Greeks of Cumae to attack the Clusian army in Rome. This effort failed, and Tarquinius withdrew to Cumae, where he died, defeated and broken. Roman forces then emanated from their central city-state to conquer the Etruscan city-states. Veii (Veio) became the object of a decade-long war from 483 to 474. Veiian counteroffensives nearly toppled Rome, which concluded a 40-year truce. The war was renewed in 438 as the First Roman War with Veii. This was followed by a second truce period, which was broken in 405 by the Second Roman War with Veii. The ultimate loss of Veii-whose citizens were sold into mass slavery-greatly eroded the Etruscan grip on Italy. Sutrium and Nepi fell to the Romans in 387, followed in 384 by Caere and Pyrgi. The city-state of Tarquinii resisted Roman conquest fiercely from 358 to 351, extracted a truce from Rome, then made a desperate alliance with Sutrium, which together rose up against the Romans. This rebellion was put down by 309, the same year in which Perusia (Perugia) fell into Roman hands. At this point Rome came to displace most of Etruria save for territory between the Apennines and forest of Cumae. The long series of Early Etruscan-Roman Wars (c. 509- 308 B. C. E.) was ended by a truce, which was quickly broken. The first new outbreak came at Arrentium (Arezzo) about 302 B. C. E. when citizens rose up against the Cilnii family, Etruscan rulers who were allied with the Romans. 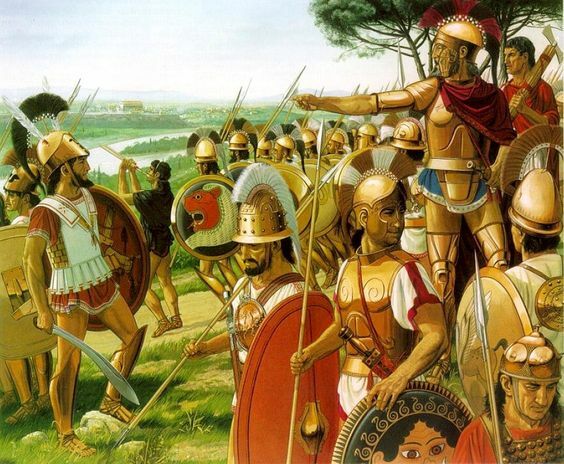 A Roman force was sent to intervene but was ambushed and defeated. After regrouping the Romans outflanked a would-be ambush at the Battle of Rusellae (Roselle) and defeated the rebels by overwhelming them with skillfully deployed cavalry units. This resulted in a two-year truce, which, however, was not taken as binding by many of the rebels. These diehards recruited allies among the Gauls and others. A major battle was fought near Volterra in 298, resulting in an Etruscan-Gallic loss, and an even bigger disaster followed at Sentium in 295, when the rebels lost 25,000 men. This shook loose the towns of Rusellae, Perusia, and Volsinii (Bolsena) by 294. The devastating defeat of the Etruscans and their allies ushered in a 40-year truce and extracted for Rome punishing indemnities. Yet again, despite the formal truce, a new Etruscan-Gallic counteroffensive was mounted in 283. Two battles were fought at Lake Vadimo, both resulting in defeat for the Etruscans and the Gauls. Epirus came to the aid of the Etruscans in the form of a force led by the able King Pyrrhus (319-272), who attacked Rome. While Epirus made headway, the Etruscans buckled at Vulci and Volsinii, which left Pyrrhus no choice but to abandon Rome and retreat to Tarentum (Taranto) on the coast of southern Italy. This resulted in the Roman War Against Pyrrhus of Epirus . As a result of their defeat, both Vulci and Volsinii lost their independence from Rome. Vulci submitted, but Volsinii rebelled against the Roman conquerors in 264. This proved a disastrous mistake, as Roman forces over- whelmed and devastated the city. From this point on Etruria was at least nominally a Roman possession. In actuality, throughout the region a low-level guerrilla war ensued during which Etruscan rebels sabotaged Roman war efforts elsewhere. Continual Etruscan provocation incited the Roman commander Lucius Cornelius Sulla (138-78) to embark on a punitive campaign throughout Etruria. Devastated, the Etruscans lost their grip on the last free cities, Valathrii (Volterra), in 80, and Perusia (Perugia) 40 years later. Further reading: Graeme Barker and Tom Rasmussen, Etruscans (London: Blackwell, 1998); Morgan Llywelyn and Michael Scott, Etruscans (New York: Tom Doherty Associates, 2000); Massimo Pallottino, Etruscans (Lon- don: Allen Lane, 1974).